Dr. Strickland is fascinated with America's regions. As early as 1964 he sought the first person, local perspective at Vermont's School For International Training where he deployed teams of foreign students to survey farmers about rural school consolidation. Years passed and he forgot about those barnyard interviews as he worked to locate, develop, and protect the Pacific Northwest Trail (PNT). During the 1970's he was totally focused on raising funds, recruiting volunteers, cutting brush, digging dirt, and lobbying landowners, officials, and politicians. However, out in the backcountry he accidentally turned up many priceless narratives. 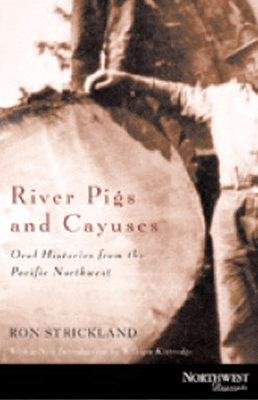 And when it became clear that people's vanishing lifestyles needed a chronicler, he collected some of those stories in River Pigs And Cayuses (1984.) The creation of that first book inspired him to record the process of change in other regions. So far he has published and illustrated 5 such volumes and begun others about the South, Midwest, and Far West. (San Francisco: Lexikos, 1984; Corvallis, OR: Oregon State University Press, 2001.) "A superbly readable index of the human presence in the Northwest" - Western American Literature (Vol. XXI, No. 1.). It is illustrated with the author's own photographs.